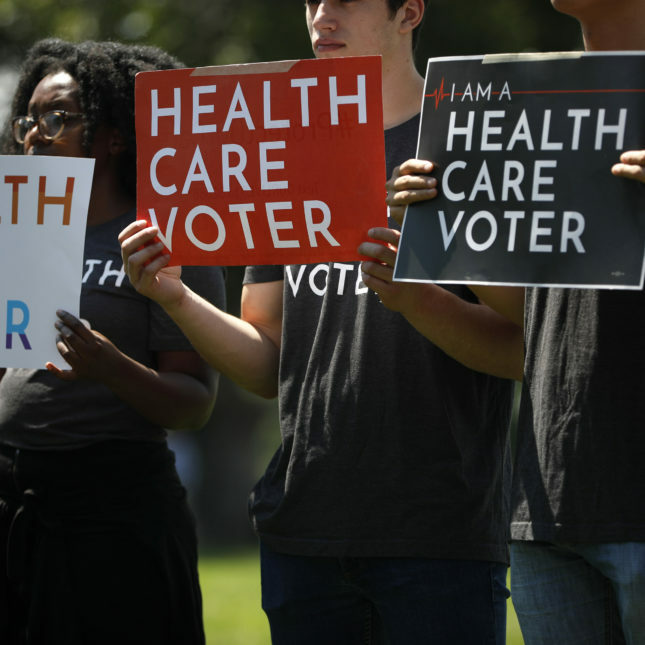 The most enduring legacy of the Affordable Care Act may be emerging now in midterm races across the country, and our health care system may never be the same. For the first time in our history, Americans are agreeing that even if you are sick you should be able to find private health insurance coverage you can afford. Not only do 81 percent of voters now think it should be illegal for insurance companies to deny coverage to people with pre-existing conditions, but both political parties have embraced this central tenet of Obamacare. Responding to Democratic attacks and polling data, Republicans are backpedaling from opposition to the Affordable Care Act’s guarantees that the more than 50 million Americans with pre-existing conditions should be able to find coverage. Writing last month in the Wall Street Journal, Republican strategist Karl Rove urged candidates to embrace the pre-existing condition guarantee, but to find new conservative strategies for securing it. This development is historic. Before the passage of the Affordable Care Act, Americans broadly embraced a national obligation to insure the elderly, the poor, and the disabled. We’ve now added the sick to this list. If the past is prelude, there will be no retreating from this commitment. Once acknowledged, commitments like Medicare and Medicaid are virtually impossible to claw back. As policymakers look to respond to this newfound promise to the sick, they will be confronted with the harsh reality of private health insurance markets: The only way insurers can offer affordable coverage to the sick is if they have a substantial number of healthy enrollees. Many of the ACA’s most controversial provisions are aimed at providing private insurers a steady supply of good risks. This includes the much-vilified individual mandate, as well as restrictions on the sale of skimpier, cheaper policies, such as short-term health plans, that appeal to healthy purchasers and siphon them away from the risk pools that cover less-healthy consumers. The ACA also provided temporary reinsurance that protected private plans against unpredictable, catastrophic losses likely to occur when they cover very sick clients. That provision, however, has expired. The challenge facing policymakers going forward will be how to execute this new guarantee that the sick have access to private insurance. A wide variety of options spanning the political spectrum exist, but virtually all require some form of government involvement. The left proposes that, if private companies don’t step up, the federal government should fill in by allowing consumers with pre-existing conditions (or even those without them) to buy into Medicare or Medicaid. As Medicare and Medicaid are among our nation’s most cost-effective insurers, this could be a way of expanding coverage while keeping costs in check. Another alternative would be to build on the Affordable Care Act’s current provisions that require insurers to cover pre-existing conditions, prevent insurers from charging more for those conditions, and provide strong financial incentives for healthy individuals to purchase private marketplace plans. Despite the repeal of the individual mandate and other attempts to undermine the ACA, private insurance markets created by the ACA have shown considerable resilience, with premiums actually declining this year for the first time since the ACA was enacted. Republicans have released legislation that would amend the Health Insurance Portability and Accountability Act to require insurance companies to sell plans to people with pre-existing conditions and not charge them more because they have been, or are, sick. Insurers, however, would be able to deny coverage for specific illnesses. In other words, insurers would have to sell coverage plans to people with pre-existing conditions, say diabetes, but would not have to cover their diabetes. Insurance companies could also increase premiums based on age, gender, or occupation. Another Republican approach, discussed during the “repeal and replace” debate, would make available subsidized plans, such as the ACA, but increase premiums over time if individuals failed to purchase them at the outset. In theory, healthy individuals would jump into the pool to avoid paying a penalty at a later date. This is an approach used under Medicare Part B, a voluntary program that covers outpatient services, that has been fairly effective and politically acceptable. Whether it would work outside of Medicare and avoid the need for more intrusive government intervention remains to be seen. The elderly are much more likely to feel that they need insurance and to respond to incentives to get it earlier rather than later, while younger, healthier people may be more reluctant to buy and then end up priced out of the insurance market. These and other routes toward coverage for sick Americans will be fiercely debated in the coming years. As we do so, we shouldn’t lose track of the profound change in attitude and expectations around health insurance for the sick that will animate this debate. Elected officials should expect to be held accountable this November, and for many Novembers to come.